Amsterdam, Johannes Jansson van Waesberge, 1676. Spain and Portugal, engraved by van der Keere. Waesberger was Jan Jansson's son-in-law. Paris, c.1692. 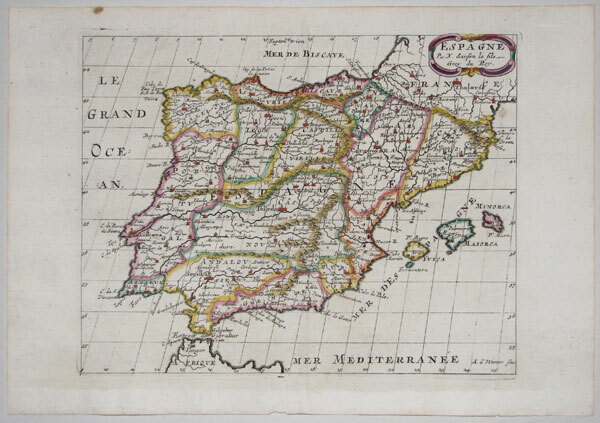 Spain and Portugal, engraved by A. de Winter for the quarto edition of Sanson's atlas. 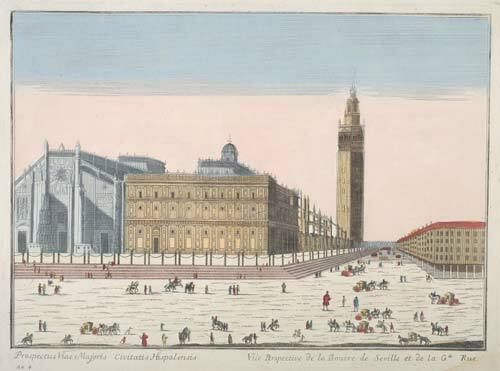 Venice, 1796. With a fine title cartouche in full colour. London, 1850. Spain and Portugal, decorated with the Prince of Wales's feathers at the top. Cologne, 1617. A view of the Royal Seat of San Lorenzo de El Escorial, the Spanish royal residence just to the north of Madrid. Paris, 1705. North-east Spain, marking Madrid, Pamplona, Burgos & Leon. 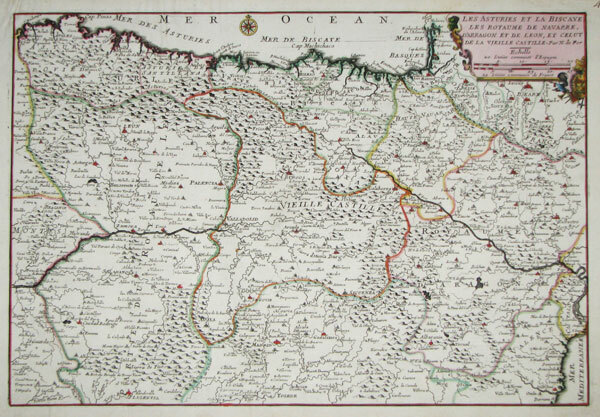 Antwerp, 1612. Andalucia west of Cordoba, marking Cadiz and Seville. c.1770. A 'vue d'optique' of Seville, designed to be viewed through a zograscope, an optical viewer. The naive colouring is standard on these prints. Augsburg, Tobias Conrad Lotter, c.1770. 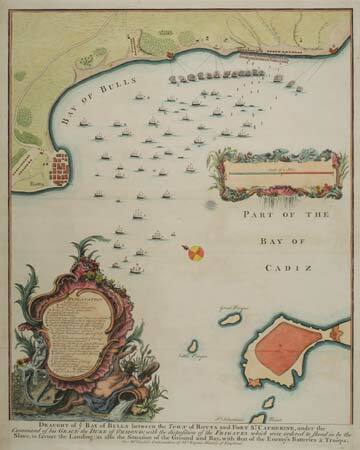 Chart of the Balearics after Bellin, originally published by Seutter, here re-issued with a larger inset of Mahon Harbour, updated to show the extensive fortifications built by the British during their possession of of Menorca. Of particular interest is huge Fort St Phillip and the 'Philippe ville' beside it, both demolished after the capture of Minorca by the French & Spanish in 1781. A second inset shows the position of the islands against the coastlines of Spain and Africa. London, c.1750. Battle plan of the Battle of Vigo, 1702, fought in the War of the Spanish Succession. Engraved by Basire for 'Mr. Tindal's Continuation of Mr.Rapin's History of England'. London, c.1740. Plan of the fortifications of the City, under siege by the French during the War of the Spanish Succession, 1701-14. Engraved by Basire for 'Mr. Tindal's Continuation of Mr.Rapin's History of England', with an extensive key. Paris, 1706. 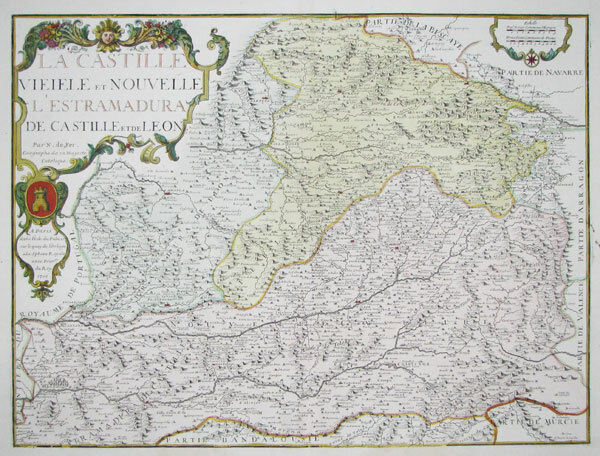 Large map of Castile and Leon, with rococo cartouches for the title and scale. Paris, 1751. 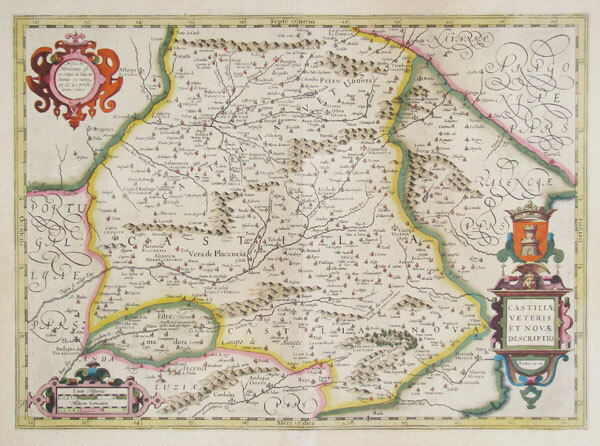 Map of southern Castile, with Andalusia, Granada, Valencia and New Castile. Amsterdam, Jodocus Hondius, 1613. 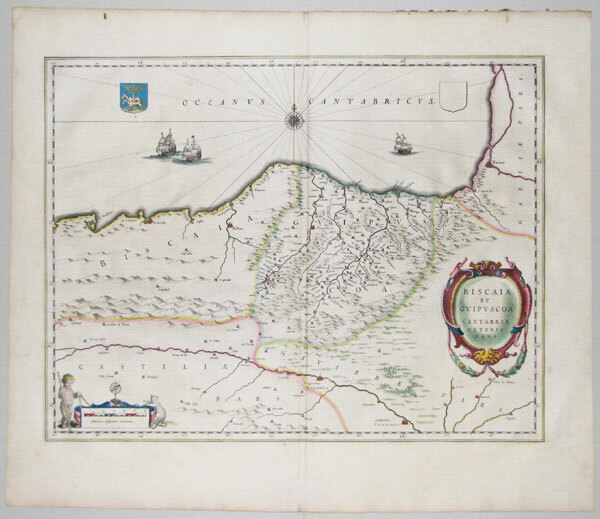 An early example of this very decorative map of Castille from Mercator's Atlas. Amsterdam, 1623, Latin text edition. South eastern Spain, decorated with two strapwork cartouches and ships. Nuremberg, c1720. With a fine title cartouche in original colour. Augsburg: Probst? c.1760. 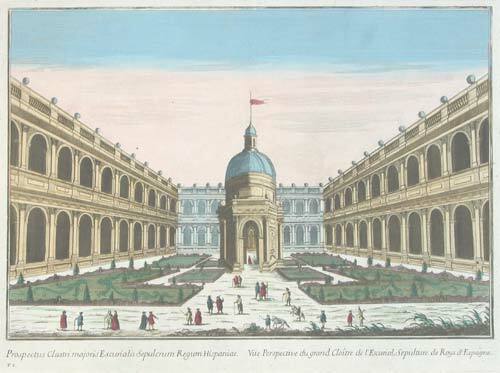 A vüe d'optique of the gardens of the Escurial Palace. Designed to be used in an optical viewer called a zograscope, the image is reversed. The naïve colour is standard with these prints. Amsterdam, 1636. 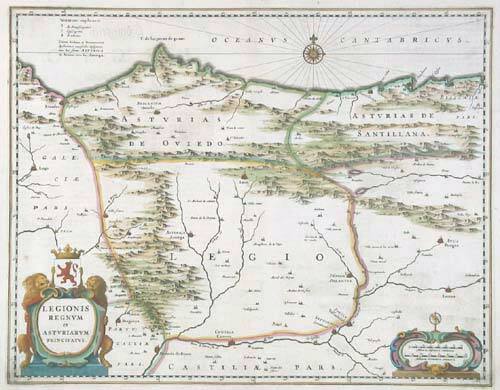 Leon and Asturias, with decorative cartouches for title and scale.